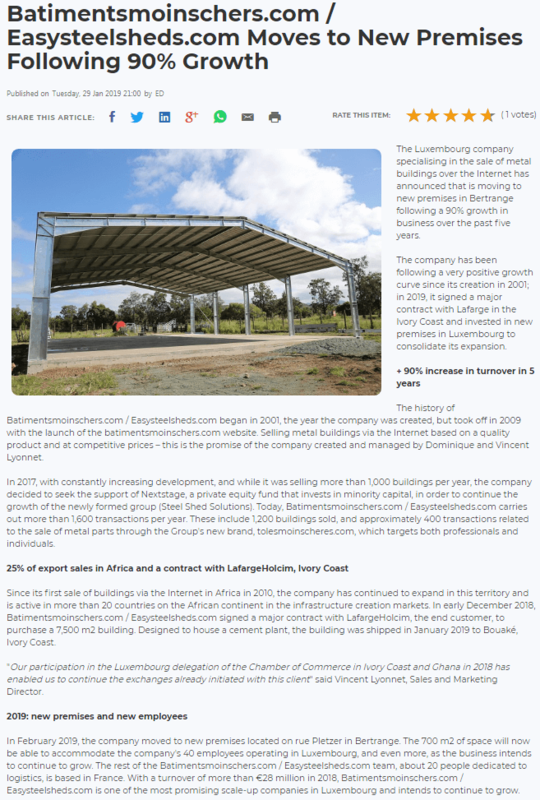 The Luxembourg-based group Steel Shed Solutions, created in 2001, is a digital platform for the sale of steel kit buildings. Steel Shed Solutions sells functional, low-cost, easy-to-assemble buildings suitable for various purposes: storage or livestock hangars, industrial buildings, agricultural structures, equestrian facilities, etc. Today the group sells nearly 1,000 buildings yearly in 48 zones and countries, with around ten languages spoken by its 35 employees. Steel Shed Solutions proposes its product offering across different websites adapted to the group’s international clientele with, in particular, the batimentsmoinschers.com website available in several languages: guenstigehallen.de (German version) and easysteelsheds.com (English version). Some of the group’s other sites focus on specific types of products, such as elfratech.fr (with ultra-discount positioning, the site offers pared down buildings to be used as simple shelters for storage) and tolesmoinscheres.com (sale of sheet metal and accessories). The digital platform is available on the web and mobile. These websites target a broad customer base, including entrepreneurs, SMEs and multinationals such as Renault, Lafarge and Eiffage, as well as institutional customers such as city councils and government ministries. The group also works with private customers via a range of kit shelters by our dedicated website direct-batiment.fr (garden sheds, carports, etc., with an area of less than 150m2). The group offers free, instant quotes online, and remains committed to maintaining low prices while ensuring first-rate quality, thanks to systematic quality control and products made with galvanized, high-strength steel and in strict compliance with European standards. Silicon Luxembourg : "Scale-up easysteelsheds.com continues to expand"
Chronicle : "batimentsmoinschers.com/easysteelsheds.com moves to new premises following 90% growth"
Silicon Luxembourg : "Interview of the founders of Steel Shed Solutions : Dominique and Vincent Lyonnet"
Reuters.com "BRIEF-Nextstage invests 11.5 million euros in Steel Shed Solutions‍​"
Siliconluxembourg.lu "Steel Shed Solutions raised €11.5 million from NextStage"
Realdeals.eu.com "NextStage backs Luxembourg-based building kit company Steel Shed Solutions"
uk.advfn.com "NextStage to Participate in the Development of Luxemburg-Based Steel Shed Solutions Group"
We are looking for sales representatives who can present our offers and sell our products to prospects who indicated to us online, that they have a building project to construct. Steel buildings in kit and construction equipments. © 2018 Steel Shed Solutions. All rights reserved.